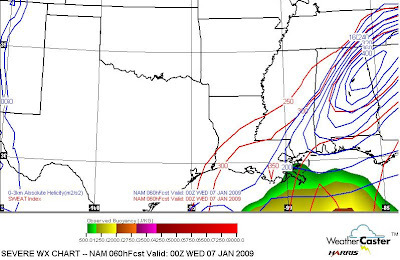 Projected helicity values Tuesday at 6 p.m. 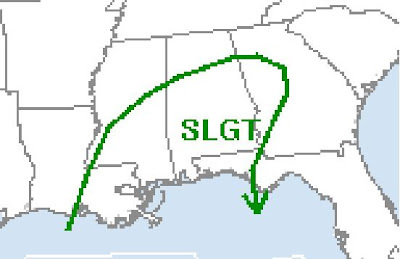 The Storm Prediction Center has placed Central and South Alabama under a slight risk for severe weather on Tuesday. Dew points will be between 60 and 65 in these areas but instability will be limited. However, vertical shear values may be rather strong. WILL BECOME QUITE STRONG OWING TO COLLOCATION OF 50-60 KT SWLY LLJ AND 80-100+ KT SWLY MIDLEVEL FLOW. WINDS AND POSSIBLY A FEW TORNADOES. Are you going to be able to get out? A little SDS Rx early in 2009. Not unless it is relatively close. I used up a lot of leave over the holidays.